Design by Aridas Sofia, graphics/stats by SITZKRIEG! Simple, sleek and deadly, the D-22 class of cruiser was originally intended to compete with the third generation of the D-4 which had been rechristened in 2239. However, as is often the case in the Empire, politics and timing played a vital role in the production and roll-out of the D-22. In 2249, a year before production of the D-22 even started, the D-4e was launched. Designers were forced to scramble to ensure that their version of the D-22 could compete. The new KD-7’s were installed to give the D-22 a fierce punch in combat. Designers also chose to install the controversial first-generation KP-1 torpedo system, which was known to have tracking problems at long range. When presented to military procurement, designers assured decision makers that an improved second-generation of KP-1 would be able to be installed once development was complete. Designers pointed to the vastly improved KWC-1 maneuvering system. The D-22 was green-lighted in mid 2250 and production began in earnest. The design its self proved popular if not practical. In order to fit the new and improved system in a class VII vessel, typical features like troop cryopods and rear mounted weaponry were removed from the design. The long upward swept wing pylons both stabilized the warp field dynamics of the compact but powerful KWC engines at high warp speeds as well as provided extra lift and maneuverability during atmospheric landings. The small secondary hull consisted mainly of the impulse engine, warp core, and small cargo bay containing a single shuttle. Crew quarters and amenities as well as some extra storage space were located in a single low ceiling deck )reminiscent of old Terran submarines) within each wing. Despite the small secondary hull size, the reduced crew complement combined with the wing decks led to a relative increase in space per crewman compared to other Klingon cruisers. This fact made the D-22 very popular with crew during long, solitary missions which were a constant assignment for there vessels. However, many of the system that were touted by designers made the D-22a a difficult ship to produce and maintain. The new maneuvering system was soon found to be more vulnerable that the less efficient but hardier older system. The hoped-for improved KP-1 never materialized, and in 2254, the new D-20 was brought into the inventory. Despite using more traditional system, the D-20 easily matched the D-22. More costly than the D-4 and less combat efficient than the D-20, funding for the D-22 was reduced even as war production ramped up. The D-22a served well during the Four Years War, but was never produced in large enough numbers to ensure it’s place in history. In total, 129 D-22a were produced. Of those, 41 were destroyed, 6 were scrapped, 4 were captured (2 by Star Fleet and 2 by the Romulans), 20 were later traded (15 to the Romulans, 5 to private interest in the Triangle), 20 are in reserve fleets and 5 are listed as missing – all believed to have defected to the IKS. The D-22a was very popular with a number of ranking families, with 33 in service to a number of the great houses. Following their losses in the Four Years War, the Klingon entered a introspection and innovation to determine how they had squandered their huge initial gains and were ultimately defeated. Chief among the reasons found was a lack of technological innovation keeping pave with their adversaries. Priority was place on advancing tactical and engine technologies and the D-22b (as well as contemporary upgrades like the D-7m and D-10d) were the fruits of that decade of research and development. The D-22b was redesigned as a fast, light cruiser incorporating new torpedo armaments, binary shields and advanced sensors. Unlike other cruisers, the D-22b was intended to operate as a lone ambush predator far from reinforcements. With as much firepower as the upcoming D-7m in a much lighter frame, it could easily lay in wait in a nebula or other sensor obscuring location and quickly disable or destroy it’s prey. The inclusion of the brand new KCC cloaking device further synergized with original role the was was intended to fulfill. Of the original 48 D-22b constructed, 38 were eventually converted to D-62’s. 6 were destroyed in combat, 2 were scuttled to avoid capture. The IKS Cha’Blk is known to be operating in service to the IKS within the triangle under a renegade Klingon captain. 1 is listed as missing along the Romulan boarder. The D-22c became the last main-line production variant. 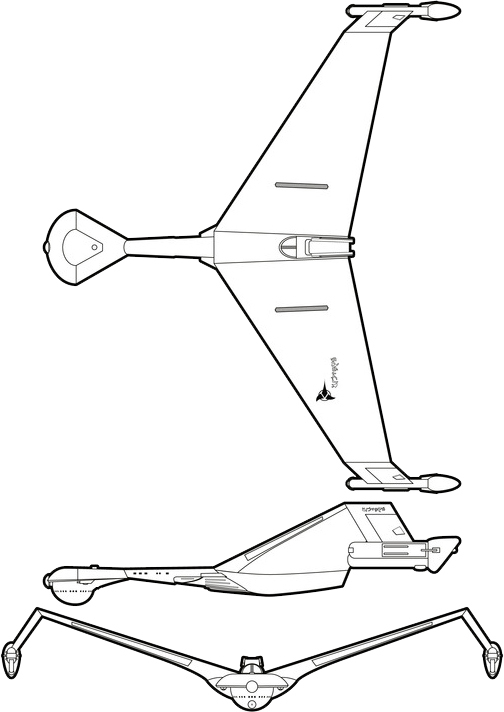 The ‘C’ variant focused on upgrading tactical and propulsion systems. Six of the longer ranged medium KD-13s replaced the original four heavy KD-8’s. The main torpedo was also upgraded to the improved KP-6 system. A more efficient KSH trinary shield meant that more power could be devoted to the cloaking system and weaponry during combat. A total of 55 were eventually fielded before production was halted in 2293. 54 D-22c’s were converted to D-62’s in late 2315. 1 was destroyed along the coreward boarder. The D-22 is named for the Klingon So’d’k Tahg, which translated to Hidden Dagger. Power Units Available – 14 ea. 18 ea. 23 ea.